Tin-zinc electroplating makes old metal parts look new again, while providing a corrosion-resistant, protective plating similar to chrome, but without the expense, hassles or hazards. Plate almost any metal part right at home, including brass, copper and steel (not for aluminum, die-cast, pot metal or stainless). 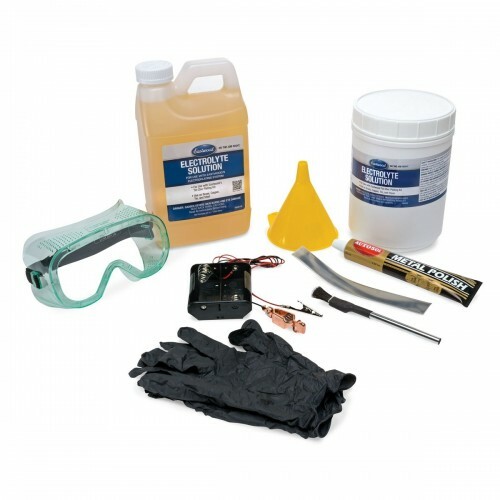 How it works: Make sure parts are thoroughly degreased and de-rusted before you start electroplating at home. 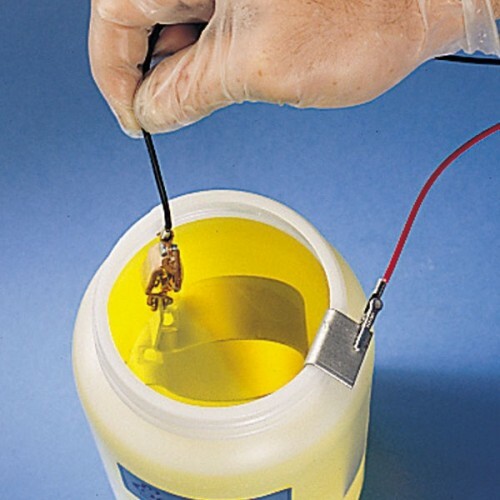 Electroplating uses electrical current to pull small amounts of metal from the positively charged tin-zinc anode bar, through the electrolyte solution, and onto the negatively charged piece to be plated. Plating begins immediately once the piece is submerged into the solution. The longer the piece is submerged, the heavier the plating on the piece will be. You may remove the piece from the solution to check the progress, then re-submerge it for a thicker coating. The tin-zinc electroplating process is complete when the piece is covered with a uniform dull gray film. Then just polish to a beautiful shine.